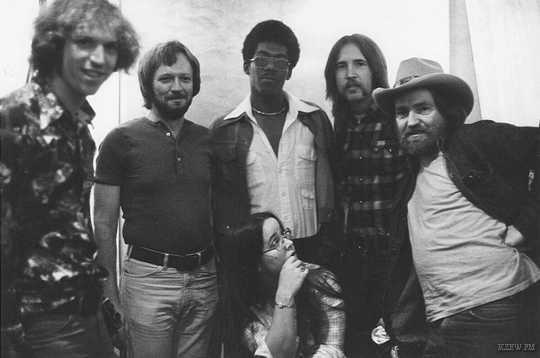 Pictured left to right are KZEW’s Ira Lipson, January Sound Studio engineer Bob Pickering, KZEW’s Mike Taylor & Mark Addy, Willie Nelson and Tracy Nelson (seated). KZEW can trace it’s roots all the way back to 1946 as Dallas’ first FM radio station, the second in the state and 66th in the country. Belo Broadcasting’s new FM station signed on October 5, 1946 as KERA-FM 94.3, only 6 weeks behind Houston’s KTHT-FM. The day after Christmas 1974, Willie Nelson did a live KZEW broadcast from January Sound Studios. Joined by Tracy Nelson (no relation), they played numerous country standards as well as a number of Christmas tunes, including Santa Claus Is Coming To Town. This concert would become a ZOO staple and was re-broadcast on Christmas Day throughout the seventies. This entry was posted on Wednesday, December 26th, 2018 at 6:38 pm and is filed under This Day in Willie Nelson History. You can follow any responses to this entry through the RSS 2.0 feed. You can leave a response, or trackback from your own site.